That is interesting to think of what doll she might have been making hers after. 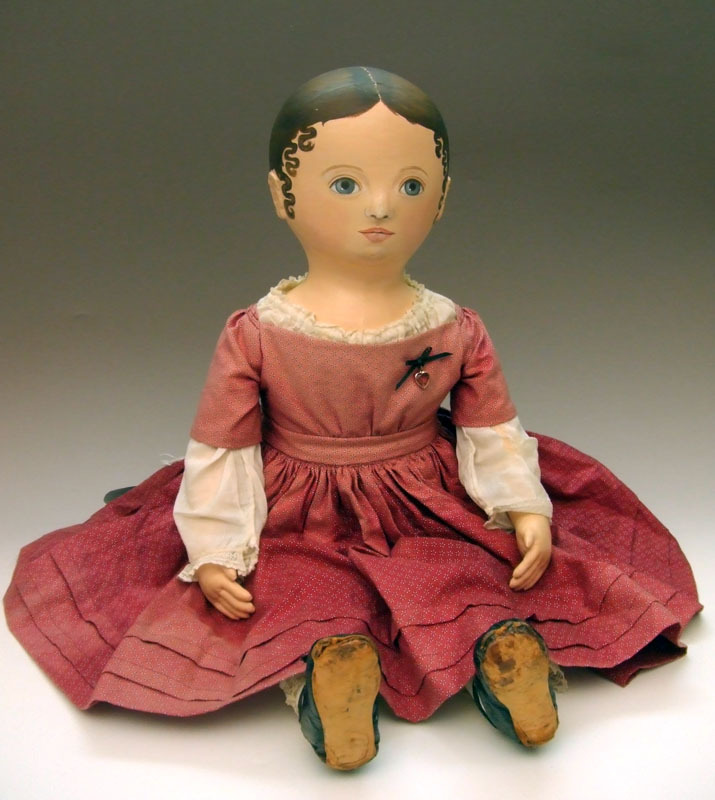 The mold she used could have been an "old" mold of a doll artist she was inspired by. Thanks for making the new place here, how exciting! Fabulous post! I too have been thinking an awful lot about this topic. I've got original chinas (more affordable) and reproduction French Fashions (because originals are financially out of my reach). As an amateur artist, I want to do more than one type of 'thing' and so I don't think I want to focus on Izannah types all the time. That could get boring, and even Izannah changed up her 'look' over time. I think there's room for all interpretations of antique dolls. And eventually, someone else will acquire an original Izannah and make a mold too. Either to make dolls or sell to artists making their own. Now that the door has been opened, it's only a matter of time. I think we'll be seeing a lot more of this type reproduction in the future. 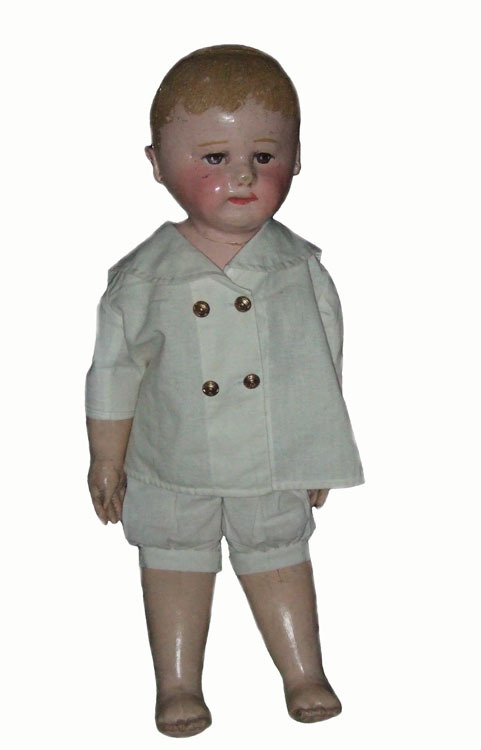 I love making all sorts of dolls, but I'm always drawn back to Izannahs. I keep seeing them with new eyes as time goes on. And I also enjoy seeing others' interpretations. They are such a rich topic for study. I hope that everyone keeps making them. The more Izannahs, the merrier! 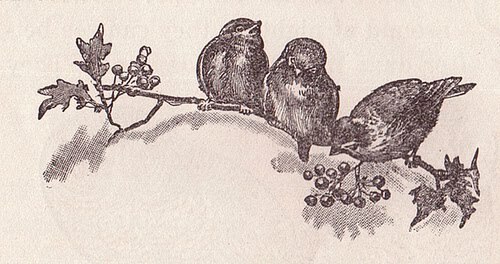 By the way, Dixie, that last part about different singers singing the same beautiful song...with those cute little birdies...sniff, sniff...that was so sweet! 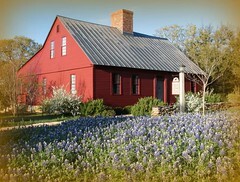 I agree with you, Dixie--there's always room for new interpretations of earlier designs. No one is going to be able to completely reproduce an IW doll, even using a mold. There are too many unanswered questions about her process and her materials. And each artist has his or her own way of "seeing" an original, be it a doll or a piece or furniture or something else from the past that inspires us. The challenge lies in developing one's own creativity and craftsmanship. She is such an inspiration, and I so admire the GREAT details she put into her work sort of reminds me of someone else I know. Great article. Using a mold of an original Izannah Doll is interesting and there are indeed some artists that utilize molds in their work. Scott Smith of Rucus Studios makes some molds of his original works and creates new art from them. Kathy Patterson is an amazing doll artist and I look forward to seeing what she comes up with. I myself think making a mold of an original Izannah is a bit like cheating. No offense that is only my opinion. 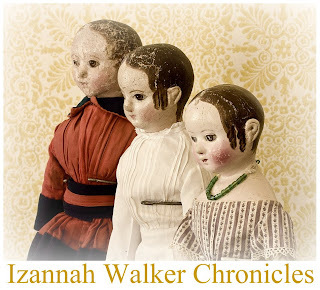 My dolls are not only created with the inspiration of the original Izannahs but also with the inspiration of all of the amazing modern doll artists that create dolls inspired by Izannah Walker using their artistry and individually to create their one of a kind pieces of art. Izannah, Dixie, Martha, Elaine, Judi, Lina, Annie, Jackie, Susie, Edyth, Barbara, Cindi, Deanna, Julie, Christine, Robin, Judy, Kimberly, Patty, Nancy and many other amazing Izannah inspired artists inspired Dolls. Great post! Thank you! Question: If a person makes a mold of an Izannah, but then does not use cloth to reproduce the doll, is it still an Izannah replica? 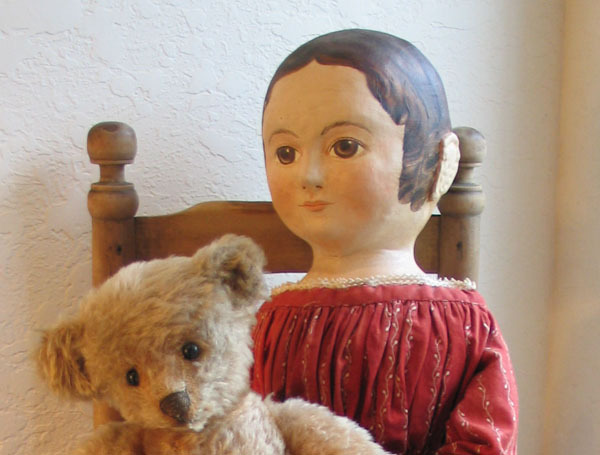 There was one such on Ebay just recently, and the seller said she had had a mold made, but the new doll itself, the seller said, was made of thin composition, poured, I would think, and then stuffed. The position of the thumb would indicate, maybe, that the mold was flexible, like silicone, rather than a plaster mold. Hi, Mary - you post an interesting question...I think a replica would mean that the same process is used and that it looks like the original creation. I question whether it's possible to make an exact replica, although I think it's possible to make a close likeness of an Izannah doll. 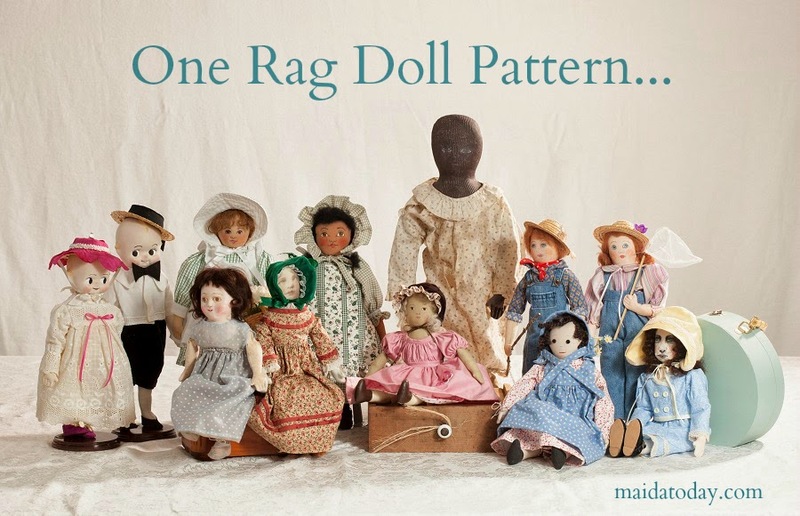 Kathy Patterson's dolls are molded from the original dolls heads/shoulders, and she makes the cloth body based on a copy of the original doll. It is painted cloth that you're seeing on the body. The head is a substance that can be poured in a mold. Her dolls look hauntingly like Izannah's, but a touch would tell you that the head is not cloth. Izannah's process was to press glue-soaked fabric into a press mold. Once that was hardened batting was placed over this, then stockinette, then "paste" then paint. Many artists are doing part of the process quite well. It's fun to see. Interesting comments, I too have wondered about the differences between Artist Izannah Dolls and copies of Izannah. Someday I would like to make my own version. I look forward to further reading. I think the fun part is we all get a chance to pretend we are living in 1860 and we give the new generation a piece of the past. Many objects are reproduced and it seems the supply does not meet the demand. 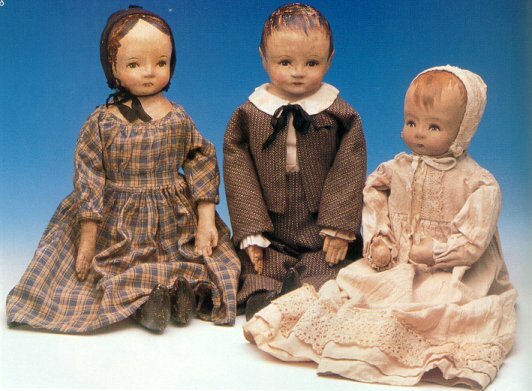 Through the ages all types and quality of dolls have sold. I certainly have got enjoyment through buying and observing.